The 8" system boast the same features as the 6" HD system but with more lift and super trick upper tubular control arms. The new upper control arms feature integrated multiple shock mounting tabs should you desire the optional dual shock system, for the ultimate in dampening capabilities. Rear lift is accomplished via a 4" block and add a leaf system with rear bump stop brackets. - Requires welding, exhaust, and possible front drive shaft mods. -?? ?2500HD only. Will not fit Suburban, 1500HD or Avalanche.?????? - May require drive shaft mods. 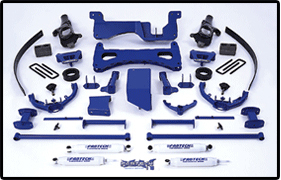 - Fits 2WD and 4WD models.